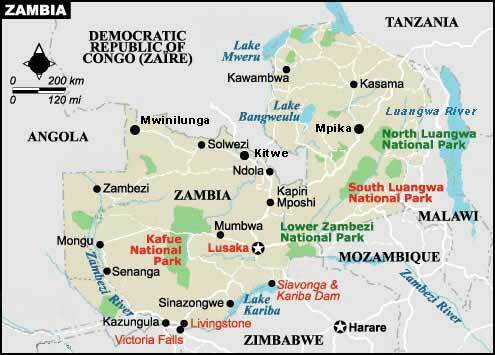 Copper mining has been the base of Zambia's economy since World War II. Despite good land, commercial farming has not been well developed. The poor in rural areas survive on subsistence farming. Manufacturing industries are few. In the cities, whole poverty-stricken shanty townships exist just above the starvation level. The AIDS pandemic has hit Zambia hard, and every family is affected by the high sickness and death rate. Now antiretroviral treatment is available free and many lives are prolonged but poverty persists. Although Zambia has had several attempted coups, there has never been any serious civil unrest as in most of the surrounding countries, and Zambians have a reputation for cheerfulness and friendliness in spite of extreme poverty. Livingstone is one of the oldest towns in Zambia, and is 11km from the famous Victoria Falls. In the last few years tourism has developed rapidly. There are two Sun International hotels next to the Falls and many lodges next to the Zambezi and hotels and guest houses in Livingstone. There are many tours and activities available, including elephant rides, white water rafting, bunji jumping, river cruises, microlight and helicopter flights over the Falls. In Livingstone town, there are many interesting historical buildings and two museums. The Livingstone Museum has papers and items belonging to Dr David Livingstone and the Railway Museum is the place for train enthusiasts. Lubasi Home is in Maramba, opposite the Maramba Market, where almost anything can be bought.